A new wing was introduced in early 1944 – type E. Structurally unchanged from the C wing, the outer machine gun ports were eliminated. Although the outer machine gun bays were retained, their access doors were devoid of empty shell case ports and shell deflectors. The inner gun bays allowed for two weapon fits two 20 mm Hispano Mk II cannon with 120 rounds/gun in the outer bays and two American .50 calibre M2 Browning machine guns, with 250 rounds per gun in the inner bays. Alternatively, four 20 mm Hispano cannon with 120 rounds per gun could be carried as per original C-wing production standard. The cannon in the E wing was slightly relocated, positioned further to the rear in its bay. Consequently, the protruding portion of the barrel was shorter and almost entirely enclosed by a new cigar-shaped fairing. 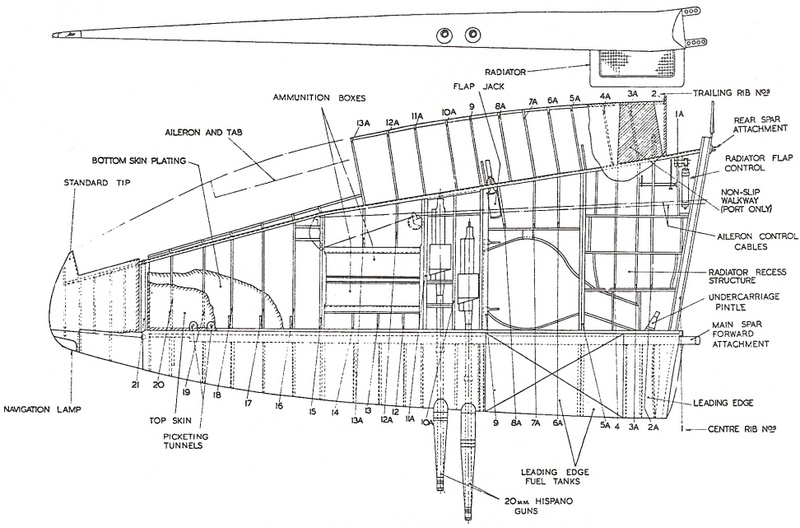 Also, the overwing blister was more narrow and a little deeper than the corresponding feature of the C wing. An interesting curiosity is that several C-wing Spitfires LF Mk. IX of No. 485 (New Zealand) Squadron were converted to carry the Hispanos and .50 Brownings just before D-Day. The Type C and E wings were structurally identical, differing only in armament installation. 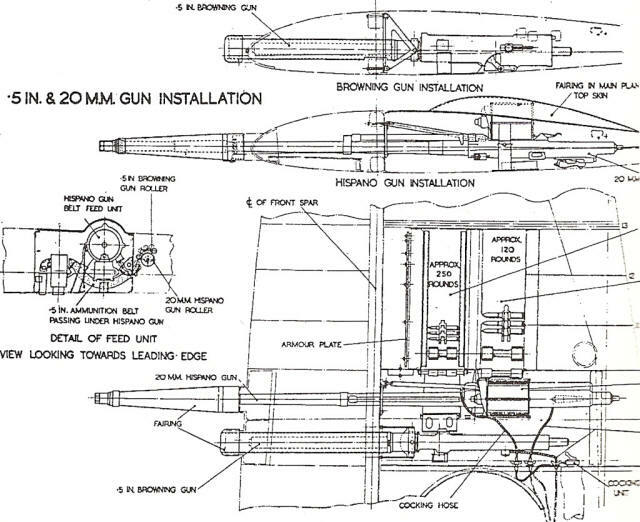 This diagram shows the layout of cannon and .5″ M2 Browning installation in the latter. Beginning with the Mk. 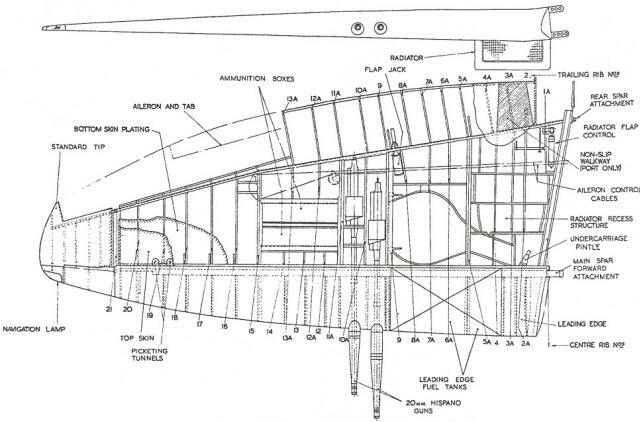 21, the Spitfire had a new, restructured wing design. The design work on the new wing started as early as 1942, but it found its way into production only by the very end of the war. New, larger area ailerons were deemed necessary to increase the agility of the aircraft in the rolling plane. To accommodate them, the wing planform was enlarged with wider chord towards the wingtips, and its internal structure revised to strengthen the wing in torsion and thus increase the useful diving speed and raise the speed limit for aileron reversal. The wingtips were gently squared-off making for a noticeable a departure form the perfect elliptical outline of the original Spitfire wing. The new wing was armed with four 20 mm Hispano Mk II or V cannon. No other armament configurations were incorporated as the RAF standardised on all-cannon armament for its post-war fighters. The Hispano Mk. V was lighter, had a higher rate of fire and a shorter barrel, leading to the protruding gun fairings being shortened even more. Also, the cannon and their belt were staggered, and consequently, the inner and outer blisters for feed motors were of different shape. Other changes included widening the undercarriage by 7.25″ (19.6 cm), with its wells placed correspondingly further away from the centerline. In order to enable larger propellers to be fitted while providing adequate ground clearance, the undercarriage legs were also longer by 4.5″ (11.4 cm). The undercarriage could be also fully enclosed in flight due to the new outer undercarriage covers. No official designation was ever given to this wing type. It was most often referred to in official letters as the “new wing”. The new wing introduced on the Spitfire Mk. 21 was only superficially similar to the preceding wing types. Internally, all aspects of its construction have been revised.